Running technique is one of the most neglected parts of running training. This is a shame, as a few important basic steps can help you improve your running technique drastically. This in turn will lead you to improve your performance and reduces the risk of running injuries. So check out the running technique tips in this article. Wish to perform at your peak? Then it is imperative you run efficiently. To achieve this, it is important for your body to use the least amount of energy possible with each step, and continue to maintain the required stride length and rhythm. To be able to improve your time, you need to lengthen your stride or increase your cadence, or both. This can be achieved by combining improved strength, fitness and proper running technique. The first thing to work on is a high cadence. A high cadence will minimize the pressure on your joints and muscles by condensing the amount of times you land on them. The longer that you keep your body in the air, the greater effect gravity plays, and the more efficient you will be. Developing the right running cadence is not easy as you may have to break from a routine you have been using for years and years. Check out the running cadence page on this website for further information. Are you a heel striker? In recent years the experts have been discouraging this running technique, still heel striking is the most common way people run today. Many great runners also use it. Heel striking is not suitable for the fastest running. But people use it for running longer distances when you are running at slower pace. When you are not a heel-striker, you land on your mid-foot. 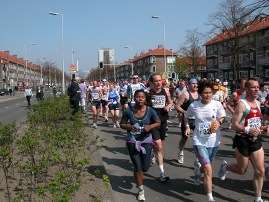 This way of running is nowadays considered to be the best way of running. The way this method works is that you use gravity to push you forward as you are landing. It is an interesting debate about what the best running technique is. I am not too sure yet about whether one is truly better than the other. It may just be that it depends most on you and what comes naturally to you. When you are interested in the mid-foot landing technique I would recommend having a look at Newton running shoes. And even if you are not interested, then just check them out as well, because Newton running shoes look pretty darn cool!!! You need to have excellent core stability to run properly. In running, in order for any force to be transmitted from one leg to the other your pelvis must remain horizontal and rigid. The core is responsible for keeping the pelvis in position. This horizontal position is essential for efficient force to be distributed. This core stability can be maintained easily and you can begin by just paying attention and concentrating on good posture. This is important whether standing, sitting or active. In addition to your running program you may want to spend some time doing cross-training like Pilates to strengthen your core. Thus, if you are looking to improve your running technique, these few steps will get you started in the right direction. Over time as you get a higher running cadence and a stronger core, You will find that you are running more effectively and efficiently. It's an essential part of your running training. So, if you are not doing so already, please make sure you take the necessary steps to improve your running technique and become a better runner.